It is becoming more commonplace for people to be prescribed an antidepressant. Whether it is due to a chemical imbalance or an unfortunate series of events, many people rely on these medications to enjoy daily activities. Another common “drug” is alcohol- many people incorporate these drinks into their normal lives, some on a daily basis. However, is it safe for these two categories to mix? 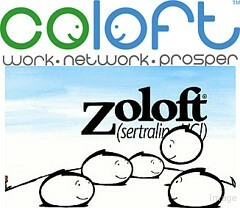 Zoloft (Sertraline) is one of the most popularly prescribed antidepressants. Its primary ingredient is a drug called sertraline: individuals on this medication most likely has dealt with depression for the majority of their lives. So when you break down the facts, you are trying to fight the depression with Zoloft. Alcohol on the other hand, is considered a depressant, it causes depression. When people mix these two drugs, it is basically enhancing their depression, as opposed to fighting it. This can lead to detrimental effects, even causing people to commit suicide because of the severity of their depression. Studies have shown too that people struggling with alcoholism have problems with depression. Add that to someone already suffering with this condition and it is easy to see that it will only exacerbate that problem. There are many interactions that you may face when mixing Zoloft and alcohol. For a normal individual, it is common knowledge that drinking alcohol just intensifies the feelings you have. If you are sad when you start to drink, you will probably be even more melancholy when you finish; if you are happy when you start drinking, you become more happy-go-lucky when you finish. So you can imagine the potential for problems when someone that is currently being treated for depression or another mental health disorder takes alcohol and Zoloft (or Prozac) together- the mood swings that they already suffer with only becomes more intense. Additionally, the side effects of Zoloft by itself can be unpleasant. These include insomnia, lightheadedness, moodiness, and nausea- these also have been proven to become more intensely experienced when the drug is taken with alcohol. The sertraline in Zoloft helps the brain to stabilize the levels of different chemicals that are produced by our bodies. When we lack some of these chemicals, it leads to depression or other anxiety disorders. As you can imagine, any medication that works with the chemicals in our body is very important and serious. Because of this, it is common that when people take both alcohol and Zoloft, they can receive DUIs and public intoxication charges because of their susceptibility to heightened effects of alcohol – not to mention the increased risk of hurting someone while under this deadly influence. In conclusion, the data and studies show very clearly that it is extremely dangerous to drink alcohol & take Zoloft together. It can have serious negative impacts on the individual’s mood – which is already struggling due to depression. The side effects in their body as well as for their emotions are very severe and should be avoided at all costs. Also, do not combine alcohol and Citalopram together.